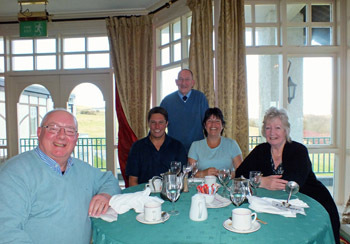 Islanders Warren Glass, Paula Swain, and Martin and Iris Green, as well Administrator-designate Alex Mitham visited the Isle of Man for training during 2013. Warren Glass from the Tristan da Cunha Fisheries Department spent four months with the Department of Environment Food and Agriculture, on the Isle of Man. He participated in a wide range of tasks, roles and shadowing opportunities, both within the Department and with external organisations. 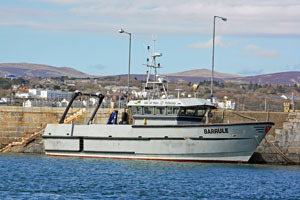 Warren was based in the west of the Island (Peel) and his first point of contact with the fishing industry was Billy Caley of Isle of Man Sea Foods. Billy operated a processing plant and Warren spent time working within the factory, gaining experience of the processes involved. 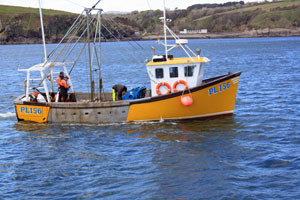 The main commercial species being scallops, crab and lobster and whelks. Collecting of environmental samples at sea. Warren assisted Inland Fisheries, with electric fishing surveys in several rivers to monitor and assess the native populations of juvenile salmon and trout in rivers across the Isle of Man. This is carried out on annual basis to determine trends in stocks and to identify any bottlenecks and areas in need to restoration or improvement. Warren also participated in the process of auditing rainbow trout stocked to the Island’s reservoirs for recreational angling purposes, by an external company, to ensure compliance with a lease agreement for provision of fish. 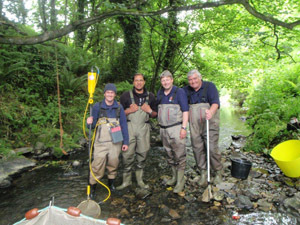 Left: Warren (second left) with the Inland Fisheries team carrying out an electric fishing survey of the Santon Burn. carried out in conjunction with the UK Marine Management Organisation. As well as a meat plant inspection to observe and discuss Meat Inspection techniques; carried out under the Food Hygiene Regulations 2006 and EC Regulation 854/2004. Warren expressed a keen interest in marine environmental monitoring and he spent time at sea collecting marine samples with the Marine Scientist. He later spent time at the Government Lab in Douglas shadowing the Scientist and following the analysis process. In summary a report from the acting director of fisheries, to the director of fisheries on Tristan stated that Warren proved to be reliable, hard working and dedicated and was an asset to all the teams he worked with. 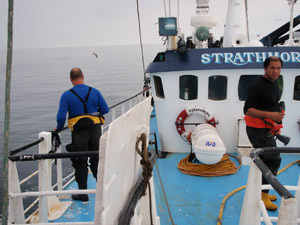 In particular his sea going skills and experience were of massive benefit to the Sea Fisheries Officers and he was constantly in demand throughout the summer to be part of the crew on board the FPV Barrule. Warren was enthusiastic to learn and very easy to get on with, he became a recognised and well liked character in Peel where he was based and all the locals and the Fisheries Department in the Isle of Man wished him all the very best for the future. Warren returned to Tristan on 28th August 2013.
standards, the internal audit office and its place in SHG, about SHG, concepts of corporate governance, risk management and internal controls (COSO framework), using Microsoft outlook, interviewing skills, gathering evidence, and completing working papers. 3. Annual Governance Statement Briefing. 5. Civil Service Learning - including Financial skills (modules 1 to 11), information Management, Problem solving, performance management, counter fraud and corruption and health and safety awareness. Paula received a glowing report from St. Helena. We are in the process of discussing how we can implement what she has learnt and hope to have the new measures in place at the beginning of the new year. The Isle of Man Government is continuing to demonstrate its commitment towards international development by strengthening its relationship with one of Britain’s smallest Overseas Territories. 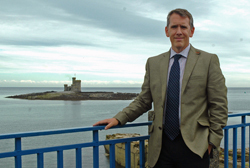 The Island is this week hosting a two-day visit by Alex Mitham, an officer at the UK Foreign and Commonwealth Office, who is set to become the 22nd Administrator of Tristan da Cunha. As part of his preparations for the role, Mr Mitham is spending two days in the Isle of Man to gain an insight into various aspects of Island life. He was welcomed to the Island on 30th July by Chief Secretary Will Greenhow and Director of External Relations Della Fletcher MBE, and met the Chief Executive Officers at the Departments of Education and Children, Economic Development, Infrastructure, Environment, Food and Agriculture, and Health. Mr Mitham also had discussions with Chief Constable Gary Roberts and senior officers from the Isle of Man Constabulary, and toured Noble’s Hospital. The Isle of Man has recently organised temporary placements for three key workers from Tristan da Cunha’s 260-strong population, helping them to acquire new skills and a fresh approach to addressing some of the challenges faced by small islands. Martin and Iris on arrival at the Isle of Man on 18th February. 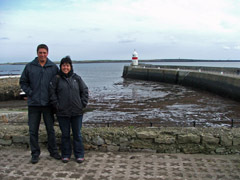 Tristan Islanders Iris and Martin Green arrive in the Isle of Man to begin four month training work placements. On Monday 18th February they met Della Fletcher, Isle of Man Head of External Relations who welcomed Iris and Martin and introduced them to colleagues who took them to sort out life's essentials such as the gas, electric, phones and somewhere to use the internet, followed by a familiarisation tour of the Douglas area so they will know their way around. The couple are finding it a bit chilly in Douglas after Cape Town, Iris reckons Martin will be testing his Tristan sweater to the maximum when out in the fields (should be a good icy blast coming in off the Irish Sea!). Chris Bates is travelling to meet Iris and Martin on Friday 22nd February, intending to meet them on Saturday and Sunday and will also liaise with the work placement officials in meetings the following week. Tristan Association members Ken and Fran Rogers are being especially hospitable and it is hoped they will join Chris, Iris and Martin for Sunday lunch on 24 th February. 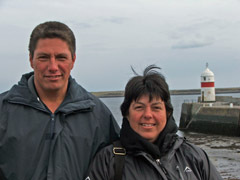 Martin and Iris Green have a busy time ahead in the Island, and are hoping to acquire new skills to put into practice when they return home to Tristan Da Cunha. The four-month placements have been arranged as part of the Isle of Man Government’s ongoing commitment towards international development with funding provided by the Tristan Da Cunha Government. Martin, who has been employed within Tristan Da Cunha’s Agriculture Department for 23 years, will be working with the Isle of Man’s Department of Environment, Food and Agriculture. His programme includes placements on Manx farms and veterinary practices, and with the Isle of Man Creamery. Iris heads the Post Office and Philatelic Bureau in Tristan and a major part of her role focuses on the production of commemorative coins and stamps. She also works alongside the tourism and handicraft industries. During her time in the Isle of Man, Iris will gain an insight into the operations of the Isle of Man Post Office, the Department of Economic Development’s Tourism Division and Manx National Heritage. 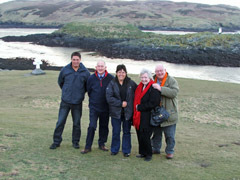 Iris and Martin joined Isle of Man residents Ken and Fran Rogers and Chris Bates on Sunday 24th February for a day exploring the island. shows Chris, Martin, Iris and Fran around the table. They enjoyed a drive around the South of the Island to overlook The Calf of Man from The Sound, then over the Hills to Foxdale and back to Douglas. It was a lovely sunny day, but bitterly cold outside the hotel and car. would like a lamp like this? with the Sound of Man behind. 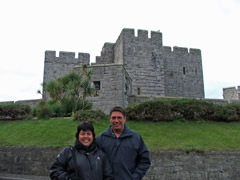 In Castletown, the one-time capital of the Isle of Man. We went for a stroll (in bitter cold!) to see Castle Rushen -- often described as the finest medieval castle in Europe: Manx Heritage have won many awards for their restoration of the interior and their interpretative work. Castle Rushen has not been "knocked about" in battle and while some of the interior shows its former use as a prison etc., or Victorian "improvements" it is complete. Iris will be working with the Manx Heritage sector later in her attachment. We also looked at the harbour and the exterior of many of the historic buildings now preserved and brought back into use such as The Old House of Keys, the Assembly Rooms, the harbour etc though didn't go into them (some were closed anyway) or ride on the steam train service from Castletown to Port Erin or Douglas (services resume tomorrow); but plenty of time for that. We went to the The Sound of Man, overlooking the island known as the Calf of Man, where a programme of "longtail" eradication is going on (Manx don't refer to r**s..word brings bad luck" on what is now a bird and wildlife sanctuary. TdC Association members Ken and Fran Rogers who were our very generous and hospitable hosts on the Sunday are in the picture. Ken and Fran Rogers organised another Sunday excursion and lunch on 3rd March for Martin and Iris Green who continue their training in the Isle of Man. Ken belongs to a local stamp group and intends to display part of his Tristan collection at a stamp fair and auction being held on Saturday 13th April. 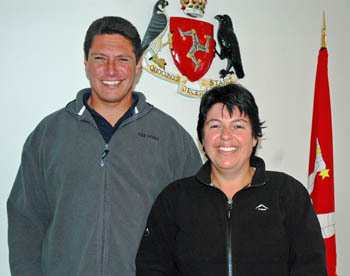 Ken hopes Iris, who is Head of Tristan da Cunha's Post Office, will be able to attend. Ken will also have available Tristan da Cunha Association leaflets to see if other Manx residents or visitors may be interested in joining. As the Annual gathering (at which Ken and Fran are stalwart attendees) is the week before, Ken also intends to have back numbers of Tristan Newsletters available. These always feature recent Tristan stamp issues. The photo left This photo was taken by the lighthouse at the entrance to Peel Harbour on a bright and breezy early spring day. It shows Fran, Iris and Martin. What is most touching about Ken's report is that he feels so lucky in being able to help the Greens. They are invited to Ken and Fran's home for lunch on Mothering Sunday March 10th, if they are available. No doubt Martin and Iris consider they are the lucky ones as the enthusiastic Tristan Association members seek to help and entertain the Tristan couple. We are delighted to announce that Martin and Iris Green will be flying from the Isle of Man on Tuesday 2nd April to stay with Sam and Bridget Kent in Gloucestershire and then attend the Southampton Tristan Annual Gathering on Saturday 6th April. It is so good to have resident Tristan Islanders to join Tristan Islanders now living in the UK and other Tristan Association members at the 2013 event, which looks like being the best attended yet. Martin and Iris will also join us for the dinner dance and stay in the Holiday Inn until Sunday. Association Chairman and President Michael Swales will drive Martin and Iris to Birmingham Airport on Sunday for the flight back to the Isle of Man. The Isle of Man has suffered unseasonal snow storms in March and it is hoped temperatures pick up for the Annual Gathering. Martin is very much in the "front line" helping beleaguered farmers to try to save their livestock buried under feet of snow in conditions which show little sign of easing. The main BBC TV News has featured events on the Isle of Man as attempts were made to rescue sheep buried in snow. The situation was described as "catastrophic" and the snow the worst since 1963. Martin is working with the farmers on this rescue mission facing conditions unknown on Tristan da Cunha’s Settlement Plain where frost and snow are unknown. Whilst higher mountain slopes get regular winter snow, sheep are always able to access sheltered gulleys and gulches with ample grass grazing on the mountain base. 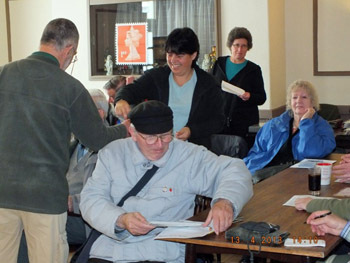 Ken and Fran Rogers accompanied Martin and Iris to the Ramsey Stamp Fair on 13th April. drawing a winning ticket for the raffle, with Fran seated right. to Stanley Gibbons for possible use in one of their future publications. 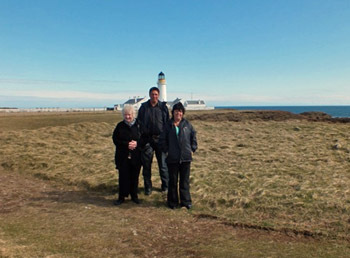 with the Langness Lighthouse in the background. Iris and Martin flew to France to attend the Cannes Film Festival on 26th May 2013. See the Tristan News Abroad Page for details of their amazing visit. 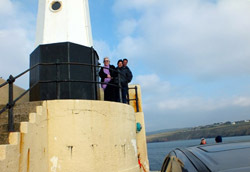 Iris and Martin departed the Isle of Man on 12th June. They wrote a report on their visit which appears with new photos all published as a feature in the August 2013 Newsletter. To get your copy join the Tristan Association.